Open up the first pdf file and fill out the top and bottom parts of the Form 180. Give as much information as possible. Serial Number, Social Security Number dates in Service etc. File out the bottom with your name and address. At the bottom you can either fax or email (stl.archives@nara.gov) the above request. If you use an email also send to NARA the 2nd attached pdf file from my site. This shows in detail what you are requesting. Most of the time NARA at St. Louis will send a response with a listing of all records. Tell them that is not enough. You are requesting copies of all the original records. NARA at St. Louis also uses the excuse the 1973 file destroyed all the records for this person. That is not true. If they respond with that then email them back the 3rd pdf file from my website. Tell them you want a rebuilt Service Record from the 1973 fire. It can be done for every person whose records were destroyed in the fire. The Privacy Act of 1974 doesn't apply after death. The only thing that survives death is any communications between the patient and Doctor or Nurse. A x-ray for example can be viewed but any conversation between patient and Doctor can't be viewed. In that case the Next of Kin would have to sign off on that. Nothing else needs the Next of Kin signatures. The Army has tried to use the Privacy Act to block Service Records from being released. They don't have the authority to do that though. Once a person is dead the records are available for any and all who make a request. The Army has tried to block having records corrected using the Privacy Act. 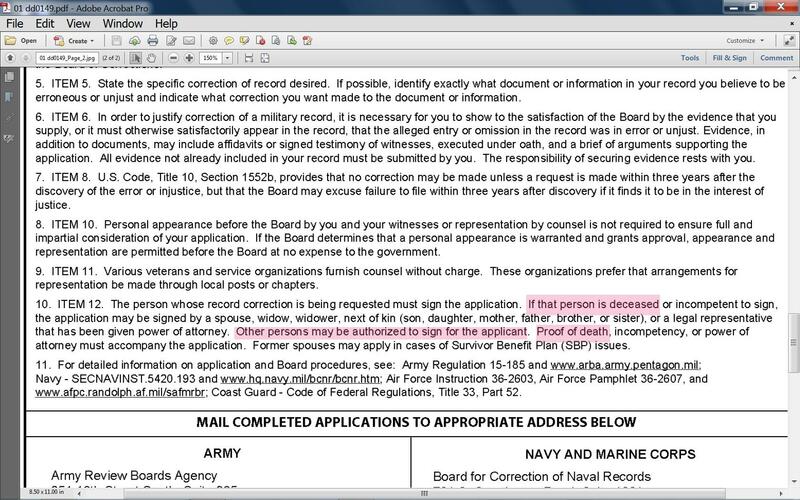 In this case the Army Review Boards Agency (ARBA) saying on page two line 10 item 12 of the Application For Corrections of Military Record that only the Veteran or the Next of Kin and correct a record. That is not correct as the Privacy Act of 1974 doesn't apply (see above). Please read the DOJ documentation in pdf 4.